Below and here are the details about the 2013 Austrian Economics Research Conference. Submissions are due December 31, 2012. For an example of the high-quality keynotes speeches, see this one from 2012! The Austrian Economics Research Conference (formerly the Austrian Scholars Conference) is the international, interdisciplinary meeting of the Austrian School, bringing together leading scholars doing research in this vibrant and influential intellectual tradition. The conference is hosted by the Ludwig von Mises Institute at its campus in Auburn, Alabama. Proposals for individual papers, complete paper sessions or symposia, and interactive workshops are encouraged. Papers should be well developed, but at a stage where they can still benefit from the group’s discussion. Preference will be given to recent papers that have not been presented at major conferences. All topics related to Austrian economics, broadly conceived, and related social-science disciplines and business disciplines including management, strategy, and entrepreneurship are appropriate for the conference. Proposals from junior faculty and PhD students are especially encouraged. This year’s conference features a keynote lecture from Dominick Armentano and a themed symposium on competition theory and policy to celebrate the 30th anniversary of Armentano’s landmark book Antitrust and Monopoly: Anatomy of a Policy Failure. A lecture from Brendan Brown, author of The Global Curse of the Federal Reserve (Palgrave Macmillan, 2011) will celebrate the 50th anniversary of Murray Rothbard’s classic America’s Great Depression. Nikolay Gertchev of the European Commission and Robert Wenzel of Economic Policy Journal will also give keynote speeches. The deadline for proposals is December 31, 2012. Submissions after that date will be considered as space allows. Decisions will be communicated by January 31, 2013. The registration fee is $285 for academics, $395 for practitioners. Registration covers all sessions, three buffet dinners, coffee breaks, and daily shuttles between AU Hotel and the Institute. To register go to mises.org/events or call 800-636-4737 or 334-321-2100. Hotel rooms at Auburn University Hotel are available. Phone 1-800-228-2876 or 334-821-8200 before February 28. Be sure to mention Austrian Economics Research Conference of the Mises Institute for the special rate of $114 plus tax (for single or double room). All proposals are peer reviewed by a conference acceptance committee. To submit a proposal, send your information to the director at papers@mises.com Abstracts should be limited to 250 words. Direct questions to conference director Joseph T. Salerno (salerno@mises.com). Entry filed under: - Klein -, Austrian Economics, Conferences. What is the rationale for changing the name of the annual conference? Can Junior Scholars Do Risky Research? united brotherhood of carpenters pension plan on What Is a Firm? ¿Vino viejo en botellas viejas? ¿Un Nobel para un astuto envoltorio?, por Mises Hispano. – Minarquia 2 on Is Math More Precise Than Words? Is Entrepreneurship a Factor of Production? What Did Keynes Mean by "Animal Spirits"? Why Do Sociologists Lean Left — Really Left? Nicolai J. Foss and Peter G. Klein, Organizing Entrepreneurial Judgment: A New Approach to the Firm (Cambridge University Press, 2012). Peter G. Klein and Micheal E. Sykuta, eds., The Elgar Companion to Transaction Cost Economics (Edward Elgar, 2010). Peter G. Klein, The Capitalist and the Entrepreneur: Essays on Organizations and Markets (Mises Institute, 2010). 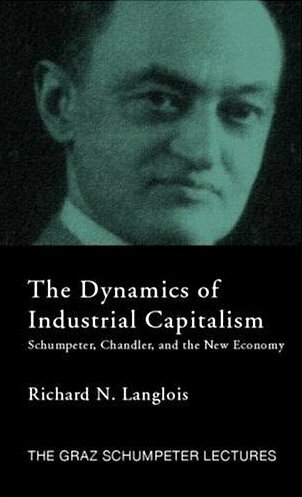 Richard N. Langlois, The Dynamics of Industrial Capitalism: Schumpeter, Chandler, and the New Economy (Routledge, 2007). 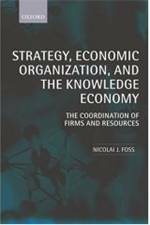 Nicolai J. Foss, Strategy, Economic Organization, and the Knowledge Economy: The Coordination of Firms and Resources (Oxford University Press, 2005). Raghu Garud, Arun Kumaraswamy, and Richard N. Langlois, eds., Managing in the Modular Age: Architectures, Networks and Organizations (Blackwell, 2003). Nicolai J. Foss and Peter G. Klein, eds., Entrepreneurship and the Firm: Austrian Perspectives on Economic Organization (Elgar, 2002). Nicolai J. Foss and Volker Mahnke, eds., Competence, Governance, and Entrepreneurship: Advances in Economic Strategy Research (Oxford, 2000). Nicolai J. Foss and Paul L. Robertson, eds., Resources, Technology, and Strategy: Explorations in the Resource-based Perspective (Routledge, 2000).